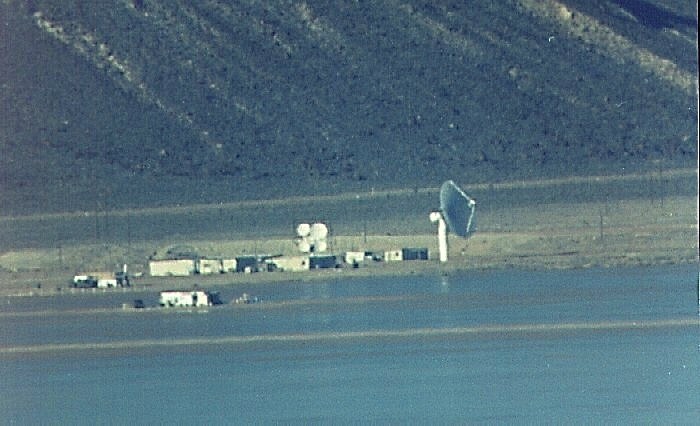 This photo shows the northernmost end of the actual base facility. Clearly in view is the second one of the two very large dishes of the Radar Cross Section (RCS) Range. They are pointed up when not in use, or north, towards the pylon on the dry lakebed and the northern Emigrant Valley, where most of the RCS test flights are conducted in the valley hidden from view by the Groom Range. The largest building to the left of the cluster of four smaller dishes is Building 130, The Dynamic Coherent Measurement System (DYCOMS) building. This and the smaller dishes are part of the DYCOMS system.